Download "Next Generation Networks architecture by ITU-T"
8 The genesis ITU-T Workshop on IP Networking and Mediacom in Geneva, April 2001 ITU-T Workshop NGN: what, when and how, Geneva, July 2003 no common understanding of what an NGN is! So why did ITU-T take lead, when there was no consensus? 9 The genesis ITU-T Workshop on IP Networking and Mediacom in Geneva, April 2001 ITU-T Workshop NGN: what, when and how, Geneva, July 2003 no common understanding of what an NGN is! So why did ITU-T take lead, when there was no consensus? 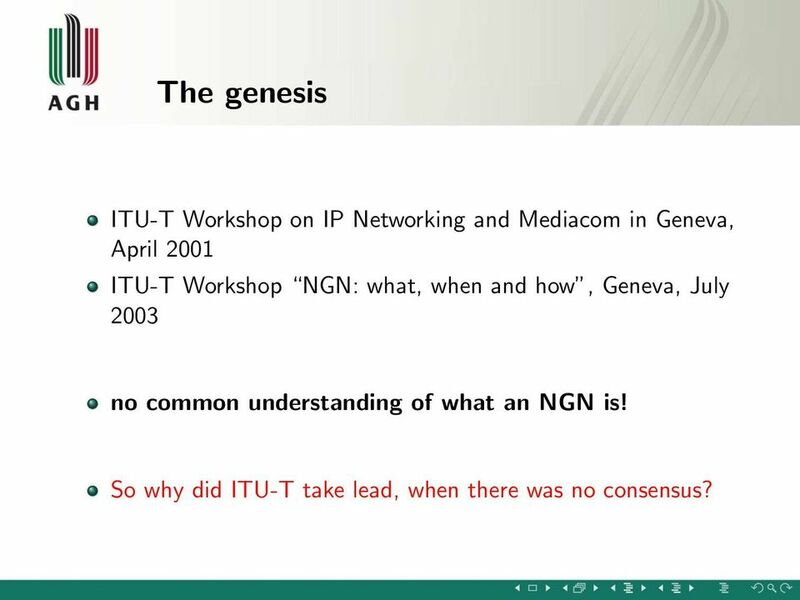 10 The genesis ITU-T Workshop on IP Networking and Mediacom in Geneva, April 2001 ITU-T Workshop NGN: what, when and how, Geneva, July 2003 no common understanding of what an NGN is! So why did ITU-T take lead, when there was no consensus? 18 Definition ITU-T Rec. 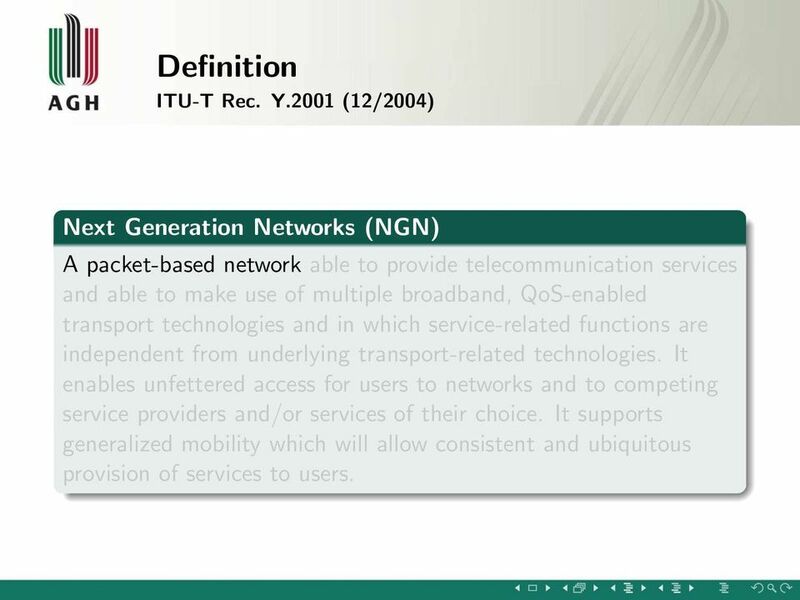 Y.2001 (12/2004) Next Generation Networks (NGN) A packet-based network able to provide telecommunication services and able to make use of multiple broadband, QoS-enabled transport technologies and in which service-related functions are independent from underlying transport-related technologies. It enables unfettered access for users to networks and to competing service providers and/or services of their choice. It supports generalized mobility which will allow consistent and ubiquitous provision of services to users. 19 Definition ITU-T Rec. 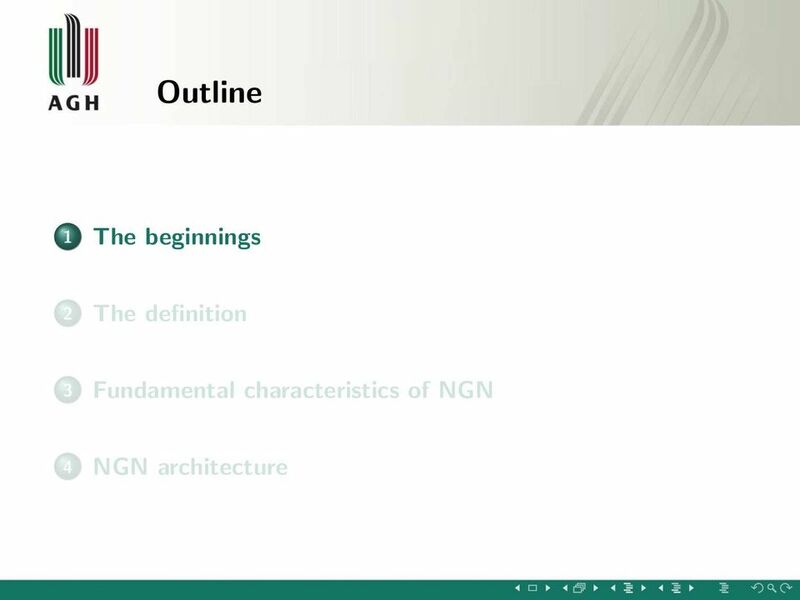 Y.2001 (12/2004) Next Generation Networks (NGN) A packet-based network able to provide telecommunication services and able to make use of multiple broadband, QoS-enabled transport technologies and in which service-related functions are independent from underlying transport-related technologies. It enables unfettered access for users to networks and to competing service providers and/or services of their choice. It supports generalized mobility which will allow consistent and ubiquitous provision of services to users. 20 Definition ITU-T Rec. 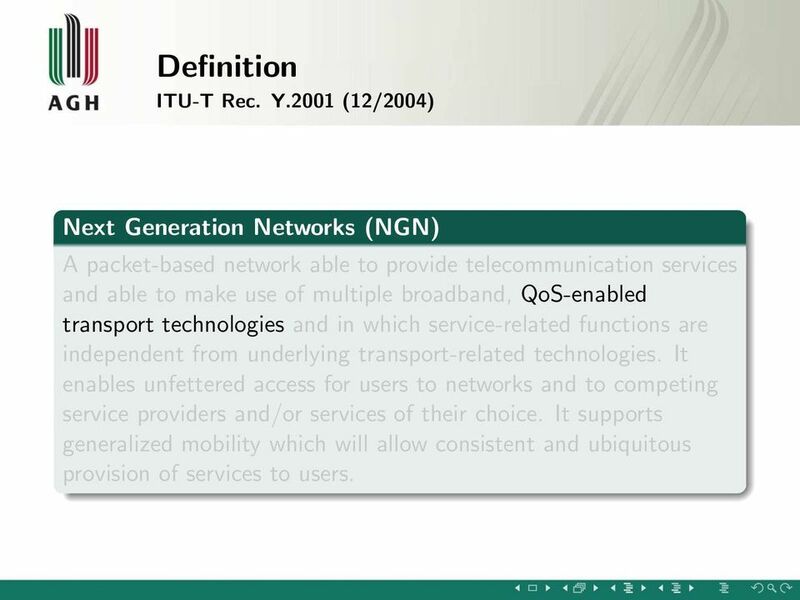 Y.2001 (12/2004) Next Generation Networks (NGN) A packet-based network able to provide telecommunication services and able to make use of multiple broadband, QoS-enabled transport technologies and in which service-related functions are independent from underlying transport-related technologies. It enables unfettered access for users to networks and to competing service providers and/or services of their choice. It supports generalized mobility which will allow consistent and ubiquitous provision of services to users. 21 Definition ITU-T Rec. 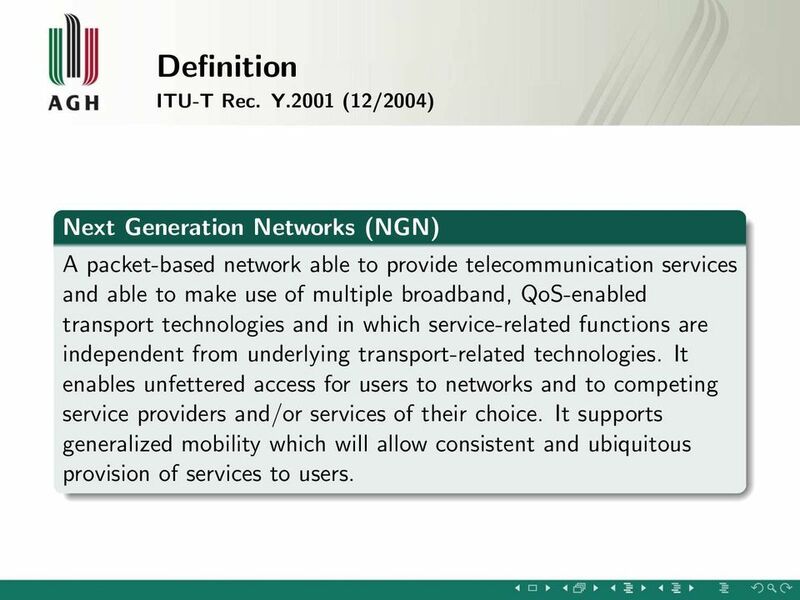 Y.2001 (12/2004) Next Generation Networks (NGN) A packet-based network able to provide telecommunication services and able to make use of multiple broadband, QoS-enabled transport technologies and in which service-related functions are independent from underlying transport-related technologies. It enables unfettered access for users to networks and to competing service providers and/or services of their choice. It supports generalized mobility which will allow consistent and ubiquitous provision of services to users. 22 Definition ITU-T Rec. 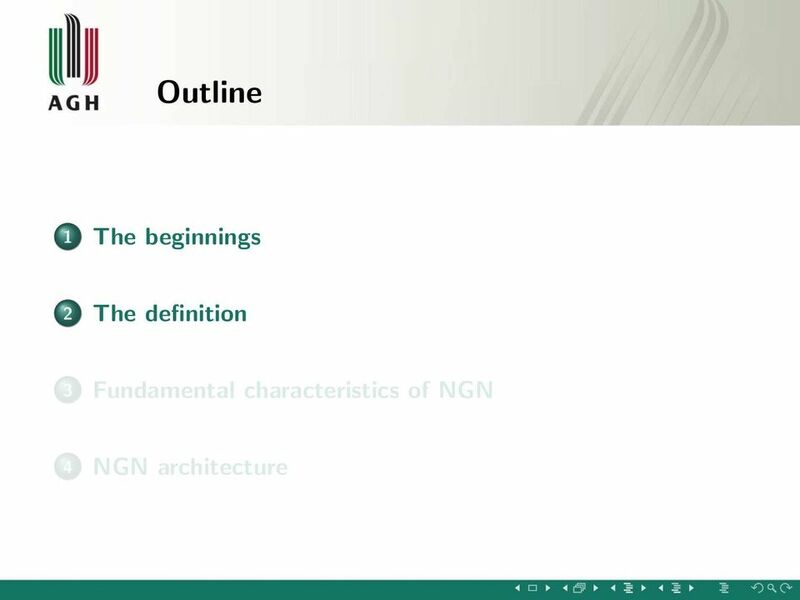 Y.2001 (12/2004) Next Generation Networks (NGN) A packet-based network able to provide telecommunication services and able to make use of multiple broadband, QoS-enabled transport technologies and in which service-related functions are independent from underlying transport-related technologies. It enables unfettered access for users to networks and to competing service providers and/or services of their choice. It supports generalized mobility which will allow consistent and ubiquitous provision of services to users. 23 Definition ITU-T Rec. 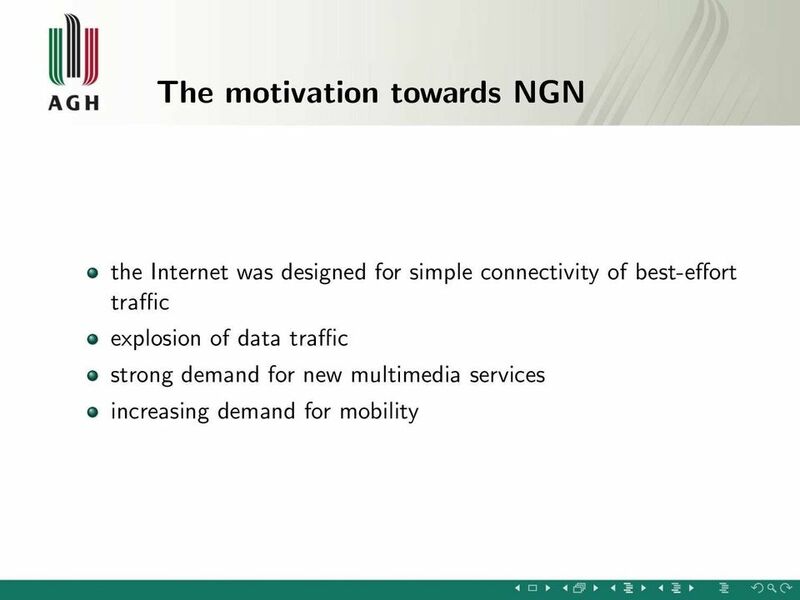 Y.2001 (12/2004) Next Generation Networks (NGN) A packet-based network able to provide telecommunication services and able to make use of multiple broadband, QoS-enabled transport technologies and in which service-related functions are independent from underlying transport-related technologies. It enables unfettered access for users to networks and to competing service providers and/or services of their choice. It supports generalized mobility which will allow consistent and ubiquitous provision of services to users. 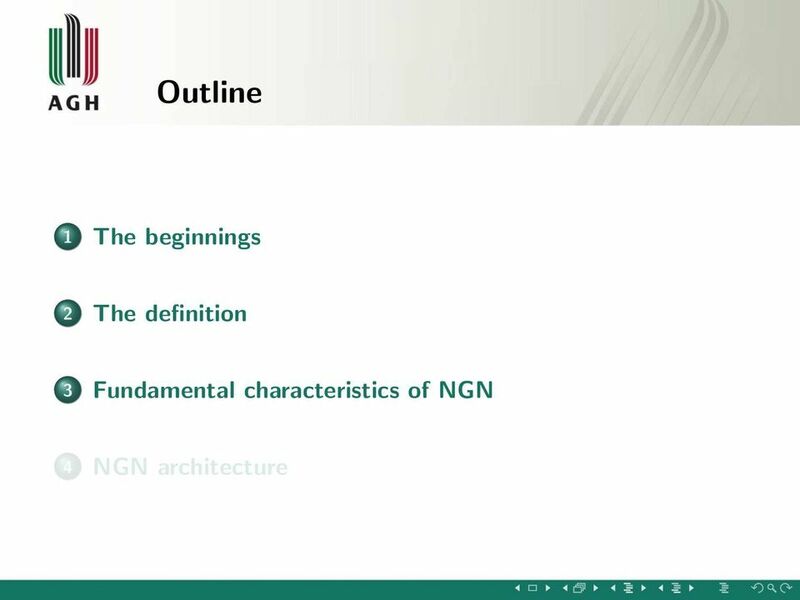 40 Fundamental characteristics of NGN Generalized mobility Generalized mobility The ability for the user or other mobile entities to communicate and access services irrespective of changes of location or technical environment. The degree of service availability may depend on several factors including Access Network capabilities, service level agreements between the user s home network and the visited network (if applicable), etc. Mobility includes the ability of telecommunication with or without service continuity. 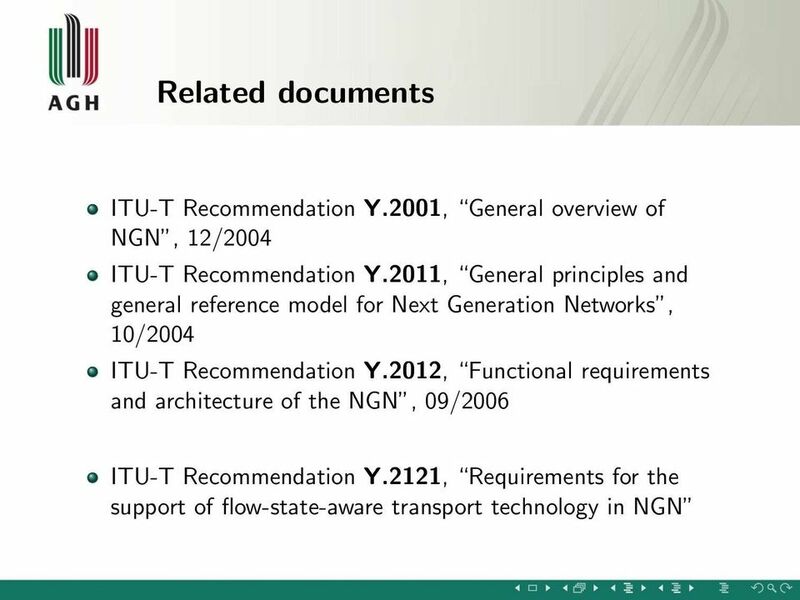 52 Bibliography I General overview of NGN, Recommendation ITU-T Y.2001, December General principles and general reference model for Next Generation Networks, Recommendation ITU-T Y.2011, October Functional requirements and architecture of the NGN, Recommendation ITU-T Y.2012, September Requirements for the support of flow-state-aware transport technology in an NGN, Recommendation ITU-T Y.2121, January 2008. 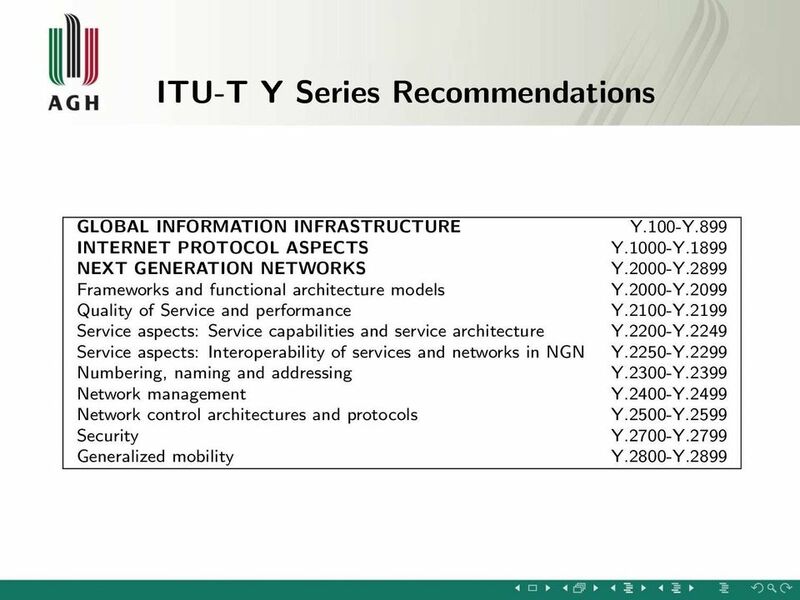 53 Bibliography II M. Carugi, B. Hirschman, and A. Narita, Introduction to the ITU-T NGN focus group release 1: target environment, services, and capabilities, Communications Magazine, IEEE, vol. 43, pp , October J. Cochennec, Activities on next-generation networks under Global Information Infrastructure in ITU-T, IEEE Communications Magazine, vol. 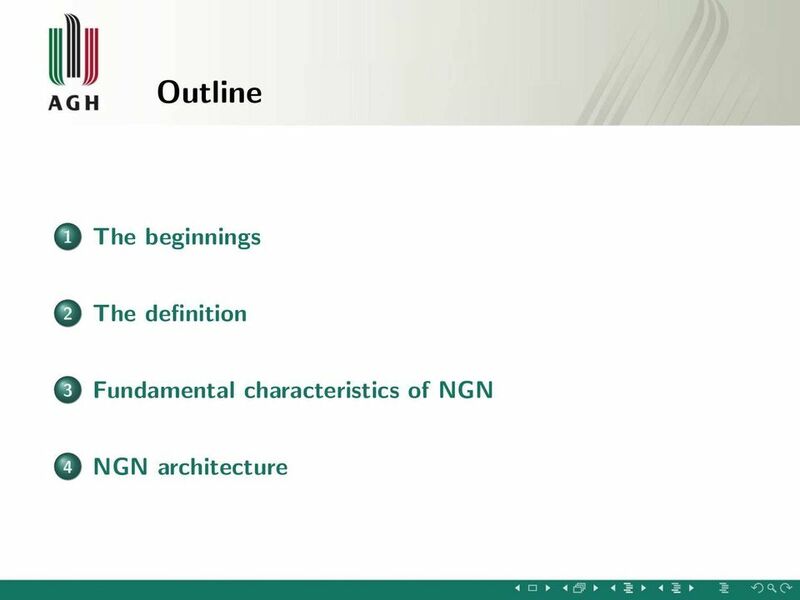 40, pp , July K. Knightson, N. Morita, and T. Towle, NGN architecture: generic principles, functional architecture, and implementation, IEEE Communications Magazine, vol. 43, pp , October 2005. 54 Bibliography III C. Lee and D. Knight, Realization of the Next-Generation Network, IEEE Communications Magazine, vol. 43, pp , October J. 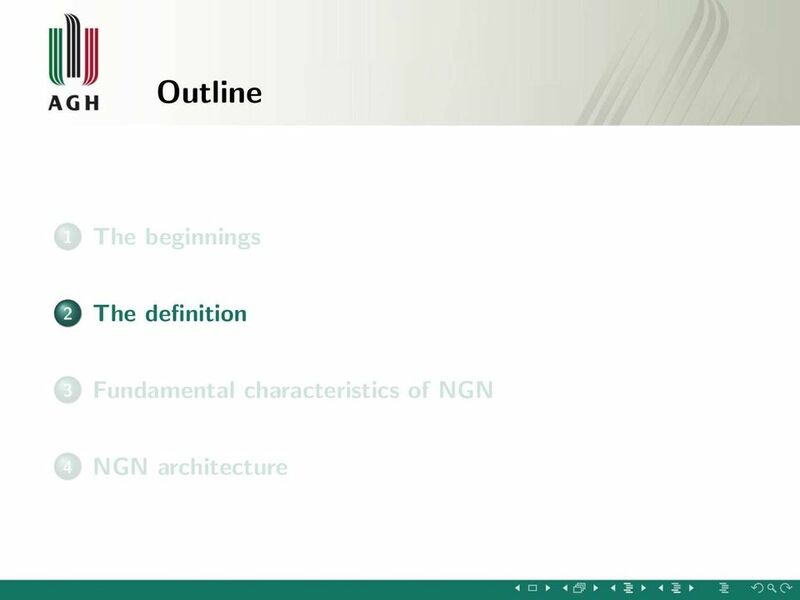 Song, M. Y. Chang, S. S. Lee, and J. Joung, Overview of ITU-T NGN QoS Control, Communications Magazine, IEEE, vol. 45, pp , September 2007. 55 Thank you for your attention! Demonstration of Internet Protocol Television(IPTV) Khai T. Vuong, Dept. of Engineering, Oslo University College. IP Voice Reseller. Deliver the VoIP services your customers demand without costly infrastructure investment or increased management complexity. Requirements and Service Scenarios for QoS enabled Mobile VoIP Service Kyu Ouk Lee, Ho Young Song Electronics and Telecommunications Research Institute (ETRI) kolee@etri.re.kr, hsong@etri.re.kr Abstract.